Microsoft is gearing up to showcase its first Windows 10 Mobile handsets tomorrow - the Lumia 950 and its XL version - along with the newest Surface convertible. The phones will be the poster kids for Microsoft's brand new push in mobile hardware, after it introduced the screen size-agnostic Win 10, and wrote off the Nokia merger, starting with a completely clean slate. A few press renders and prototype photos of the new Lumias have already leaked out, along with their specs, so we pretty much know what to expect in terms of hardware. 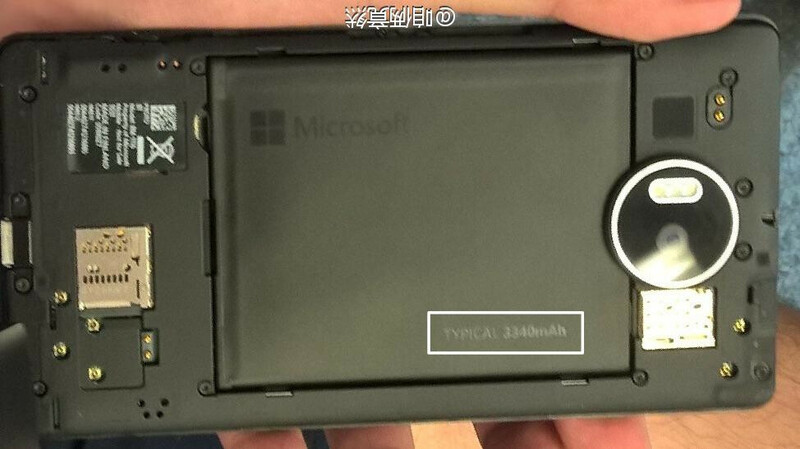 What we didn't know so far, however, that the rumored 3300 mAh battery of Lumia 950 XL might be removable. The pictures below display a prototype with 3340 mAh typical capacity, meant to be pried out, and a SIM card or a microSD slot inserted, then put back into place. That's quite the departure from the usual Lumia sealed battery concept, so tomorrow we'll be all ears if that claim turns out to be true. This is very good! If battery dies (out of warranty) you can replace it yourself, or just put a different battery with more capacity in it. These days, rarely people use their smartphones till their batteries die. That would at least take 18-24 months with very aggressive usage, while people mostly change their smartphones after 6-12 months, also most of them don't use their smartphones that much aggressively. Dont judge before you see the phone in real life. Almost all Lumia phones look plain in renders and photos but almost everyone is good looking in real life. Its also a question of durability. Drop an iPhone on its face, you have a broken display. Drop it on the side and you have a big dent on it. Same goes with Samsung's new designs. I agree with you, they look much better than these Lumias but you don't want to have a product you use all the time and always think of the way you handle it.. But the latest iPhone seems to do very well in drop and water tests. I do not own an iPhone but it looks better than this phone but not as good as Sony Z5 Premium in my opinion. iPhone looks decent in my opinion. Bezels are still too large and the rounded edges on such a thin device make it very uncomfortable to hold in my opinion. They can take a few falls just fine though, so I like that it has better build quality than previous generations. They should be using better glass by now though, as theirs is not as durable as Gorilla Glass. The Galaxy Note 5 looks great. Great screen to size ratio and good, flat aluminum sides. Back made of glass is unforgivable though for me. We all pointed this out when Apple did it with the iPhone 4S. In the 1-2 years you are going to own it, you will almost certainly drop it at least once. The 950 and 950 XL are cases where form is following function. Not the prettiest, but not ugly. Largely utilitarian and functional, but it is understated and will have a very nice looking screen. Lumias have been doing this "infinity" type glass for a while, and they look beautiful with AMOLED displays. Hopefully the black 950 doesn't give that ugly think rim around the camera. Why the heck did they do that. The thin ring on the XL looks much better! With that crapdragon 810 inside, it needs all the battery it can. Oh come on, give it a cha.... nevermind, 810 is crap. Let's wait for battery tests. Besides, I never said 810 is slow. I said it's inefficient. I watched for about 4 minutes of your video and the S6 still seems faster. /remember the S6 is about 300$ cheaper and 6 moths older phone compared to Z5. Sorry, I stopped reading at crapdragon, my bad. Yes, SD810 dvices seem to have worse battery life. Let's see what the battery life will be on the XL. With how the OS works probably about the same as the 1520 or maybe longer. 12hrs on video on the 1520 is nothing to scoff at. How many smartphones with 5.7+" displays got roasted by the SD 810? (I actually don't know the answer to that, myself). That 2% market share is going to explode because of this to at least 2.5%. Are the prices of Lumia 930 expected to go down after the introduction of 950? Removable battery, Expandable storage, great camera, iris scanner, great polycaronate design, QHD screen, fast processor, Windows 10! It checks every boxes. Best phone of 2015! I am a BlackBerry fan but I still have to use a couple of Android apps that just do not exist for BB. Windows Phone has the same problem and needs to fix it quickly. Otherwise the end result will be like today when I decided to use my Nexus 6 instead. I'm sure you never used one. If you had you would not be saying that.